November 6, 1969. 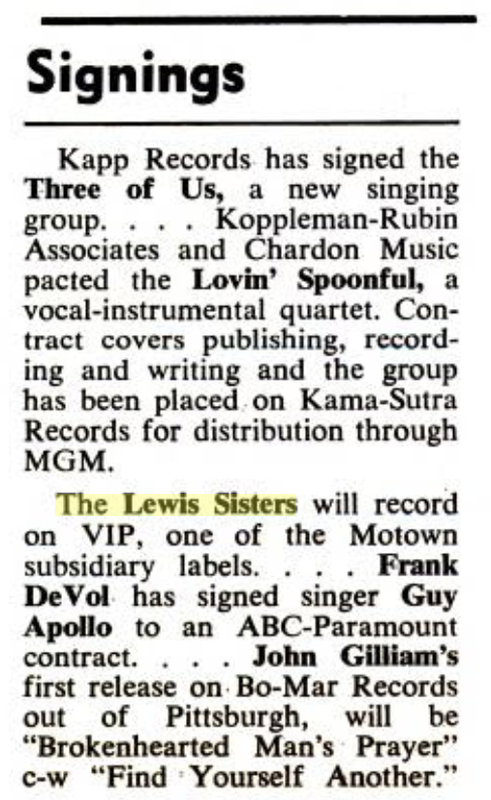 American magazine Jet carries the official announcement, confirming something that’s been long rumored: DIANA ROSS TO LEAVE SUPREMES; ERNIE TERRELL’S SISTER ADDED. After nearly a decade on the Motown label, The Supremes are now international superstars with a stunning string of #1 pop hits; Diana Ross has become the focal point of the group, singing lead on every one of those hits and dominating press coverage surrounding the trio. According to the article, “Miss Ross now feels The Supremes — Mary Wilson and Cindy Birdsong — and she have reached the highest plateau possible in their particular branches of the entertainment world.” In other words, she’s ready to climb to new peaks as a solo artist. While few can be really surprised at the news of Diana’s departure, it’s the second half of that headline that raises many eyebrows, not to mention an important question: Who is Jean Terrell? Supremes manager Shelly Berger has the answer: “Berry [Gordy Jr., Motown founder] and I happened to be in Miami Beach, and the boxer Ernie Terrell invited us to come and see a show he was doing in the lounge at the Fontainebleau Hotel. His sister Jean stepped onstage and she looked sensational and she sounded great. Berry said, ‘We’ve found our new lead singer'” (Supremes box set booklet). Terrell signed a solo contract with Motown, but was soon recording with Wilson and Birdsong; recording dates really picked up in the immediate aftermath of the group’s final show with Diana Ross, held on January 14, 1970. Producer Frank Wilson worked up part of the “new” group’s debut album, including its two singles; Mr. Wilson was part of the team behind the hits “Love Child” and “I’m Livin’ In Shame” for the Ross-led Supremes, and he’d produced their popular collaborations with The Temptations. 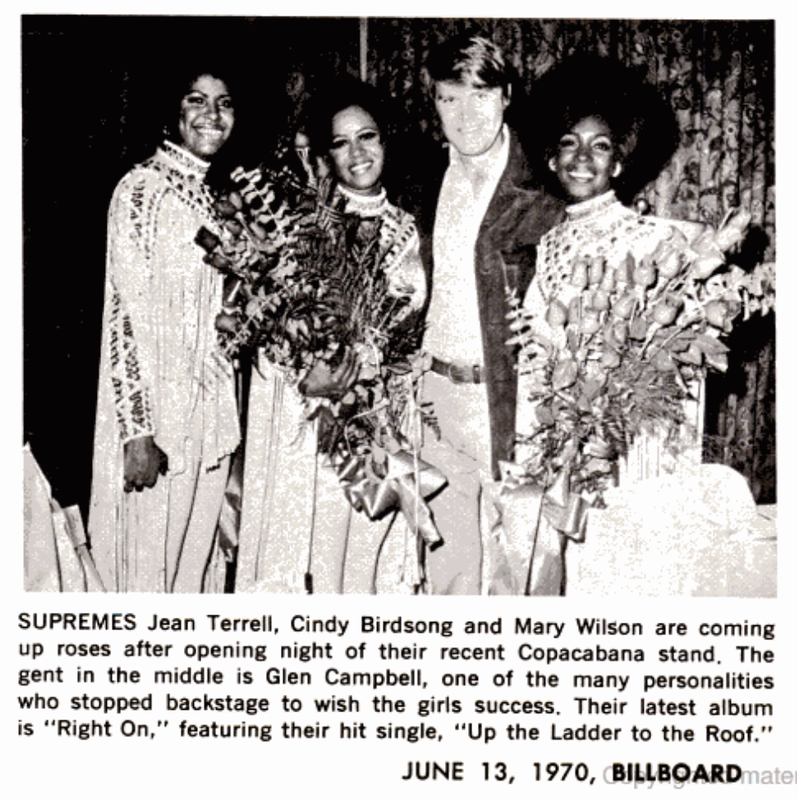 Terrell, Wilson, and Birdsong also worked with Johnny Bristol, as he’d produced the recent #1 hit “Someday We’ll Be Together” for Diana Ross and The Supremes; a Bristol production called “Life Beats” was floated as a possibility for the new lineup’s first single, but it was shelved. Interestingly, while Nickolas Ashford and Valerie Simpson took Diana Ross straight into soul territory with her debut album, Diana Ross, producers went the other way with The Supremes, layering in elements of blues, rock, and folk music right from the very beginning. These sounds would become more prominent over the next few albums, but they’re present on Right On, with Frank Wilson in particular casting the trio almost as ethereal beings of love, their voices floating around bouncy instrumental tracks and never getting too heavy to bog down the songs. Although it surely wasn’t planned or intended, the end result is that Diana and The Supremes never really competed against each other in terms of musical style, something that helped each establish a separate identity. The message of “Everybody’s Got The Right To Love,” for example, mirrors that of Diana’s “Reach Out And Touch (Somebody’s Hand),” but the latter song is best described as glossy gospel-pop while the former uses acoustic sounds and a shuffling twang to evoke an earthier sound. The world finally got to hear Jean Terrell, Mary Wilson, and Cindy Birdsong as The Supremes on February 15, 1970, when the trio appeared on “The Ed Sullivan Show” to perform the new single “Up The Ladder To The Roof.” A day later, the song was released to the public, and met with universal acclaim (Billboard called it “a blockbuster”). By May, The Supremes were back at the prestigious Copacabana nightclub in New York, thrilling fans including writer Cordell S. Thompson, who in his Jet column described Terrell as “a lively little spark plug” (May 7, 1970). Nobody could have asked for a better relaunch of the group, and Right On emerged as an exciting announcement of a new chapter for The Supremes. 1. 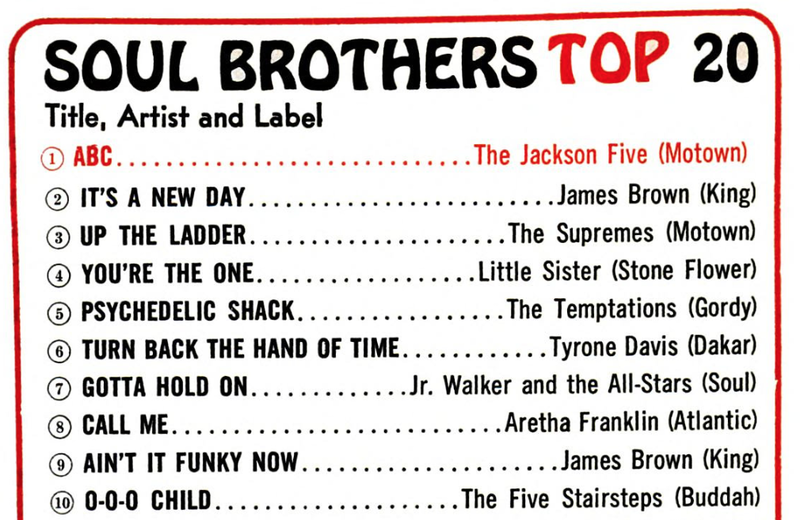 Up The Ladder To The Roof: “First for the girls with Jean Terrell in the lead is a blockbuster” raved Billboard on February 28, 1970, and soon thereafter the single would race up the charts, eventually peaking at #10 on the Billboard Hot 100 and #5 on the R&B side, along with returning The Supremes to the top 10 in the United Kingdom. Indeed, this is a stunning single, and Frank Wilson would later remember its inception in the liner notes to the 2000 box set The Supremes: “[It came from] a Puerto Rican kid, Vince DiMirco, in New York. I just loved the melody and chorus, and I came back to Detroit and re-wrote it to fit Jean. The girls were working live so much I’d cut the tracks, get on an airplane and go to where they were. We may have recorded the vocals in Vegas or D.C.” Session notes list the track recording date as January 30, 1970; that was a Friday, and just two weeks later (Friday the 13th, to be exact), the group was preparing to make its debut on “The Ed Sullivan Show” that weekend. “Up The Ladder To The Roof” opens with a gentle call to listeners, the ladies seductively crooning “Come with me…” in unison, before the track slowly picks up steam and builds into a funk-lite workout with a galloping beat and potent combination of percussion, strings, and horns. Jean Terrell possesses a smooth soprano; at its best, her voice sounds completely effortless, as though the sounds are simply falling from her mouth without any strain at all. That’s the case here; even as she reaches for higher notes or engages in some light riffing, she’s never audibly “working” at the performance. Mary Wilson and Cindy Birdsong each get a brief solo during the song’s chorus (that’s Mary, and then Cindy, repeating the words “Where we can be”), allowing the women a nice opportunity to shine and creating a real group sound, as opposed to a solo singer with background vocalists. 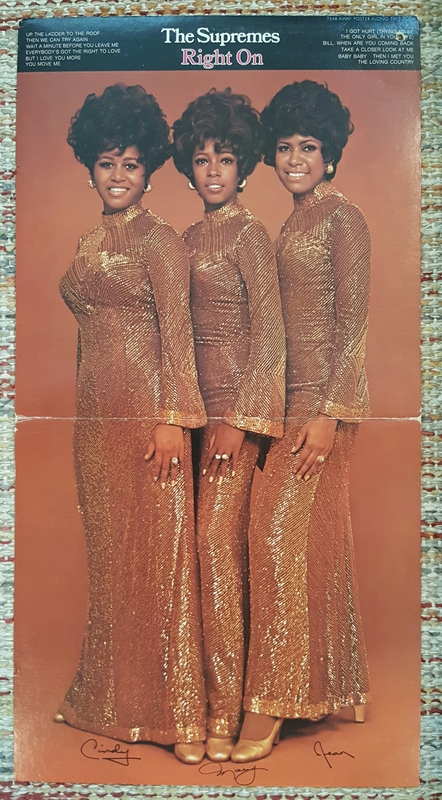 This was apparently a deliberate move by Frank Wilson, who described his task as producer: “To guide the soloist do you don’t lose the power of the song itself, then, of course, then ability of Mary and Cindy to participate in the song and really sing” (Supremes booklet). In the end, “Up The Ladder To The Roof” more than accomplished its difficult job, which was to smoothly bridge the transition from Diana Ross and The Supremes back to Then Supremes, and it emerges as easily the best song on Right On. 2. Then We Can Try Again: According to website Don’t Forget The Motor City, this one was produced by Clay McMurray, who also produced the #1 R&B hit “If I Were Your Woman” for Gladys Knight and The Pips that same year. Written by McMurray with James Dean (who’d co-written “Everything Is Good About You” for The Supremes back in ’65), this is a swinging tune with a nice, earthy feel anchored by some powerful piano work and joyous horns. The song gives Miss Terrell more of a workout than the previous track; she’s as relaxed as she was on “Up The Ladder To The Roof,” but allowed to be a bit more soulful and put some power behind her vocals. Listen at 1:19, as she delivers the lyrics “Boy you made me do it/I’m leavin’ against my will” — she nails the notes with confidence while retaining a kind of lightness to her voice that’s really appealing. Terrell is backed by a lovely choir of voices, but it’s tough to tell exactly who those voices belong to; it could be The Supremes, it could be session singers, or it could be a combination of both. Certainly the distinct vocals of Mary Wilson and Cindy Birdsong aren’t definable here, as they were on the album’s lead single. That said, this is a terrific recording, and one of the best songs on Right On; it probably wouldn’t have been a big hit if released as a single, but it’s a memorable recording that’s hard to resist singing along to. 3. Everybody’s Got The Right To Love: This song was the second single lifted from Right On; released on June 25, 1970, it just missed the top 20 of the Billboard Hot 100 (peaking at #21) and similarly missed the top 10 of the R&B chart by one spot. This is another Frank Wilson production, and the tune was penned by the prolific Lou Stallman, who also composed the classic “It’s Gonna Take A Miracle,” made a hit by both The Royalettes and Deneice Williams. “Everybody’s Got The Right To Love” boasts a “peace, love, and understanding” message evocative of the early 1970s; as noted earlier, its message is similar to that of “Reach Out And Touch (Somebody’s Hand),” which was released the same month as Right On. Wilson’s arrangement gives the song a distinctive twang; performed by a different group, it might be considered more country-pop than soul. The instrumental here is driven by a finger-snapping beat and jangling guitars, with the lighter-than-air vocals delicately placed atop the band. 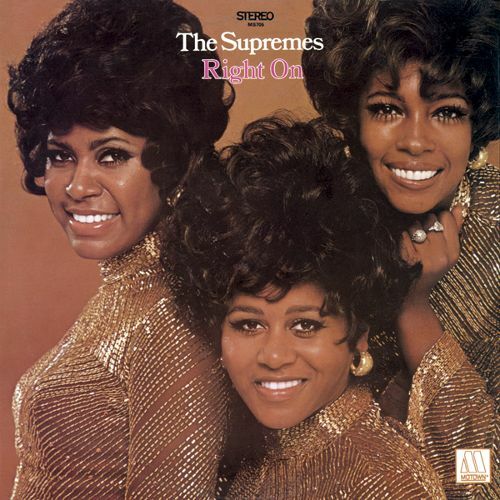 The song is another great showcase for the vocals of all three Supremes, featuring nice harmony on the chorus and plenty of “shout-outs” for Mary and Cindy. Miss Terrell delivers much of the first verse in her lower register, and it’s an appealing change of pace; when she returns to her now-familiar higher voice, she keeps it fairly restrained here, smartly letting the lyrics take center stage and resisting any urge to oversing. In her 1990 memoir Supreme Faith: Someday We’ll Be Together, Mary Wilson remembered first hearing the Frank Wilson-produced songs, including this one: “As the three of us listened to the instrumental tracks over the huge studio monitor speakers, we beamed with happiness. We’d spent part of the past six months working with several great producers, but no one had created a sound as fresh and well-suited to us as this” (12). Indeed, Frank Wilson was emerging as a perfect match for Terrell-Wilson-Birdsong, and this song is a standout. 4. Wait A Minute Before You Leave Me: Jean Terrell is backed by a crowd of voices that don’t sound much like The Supremes on this charging tune. 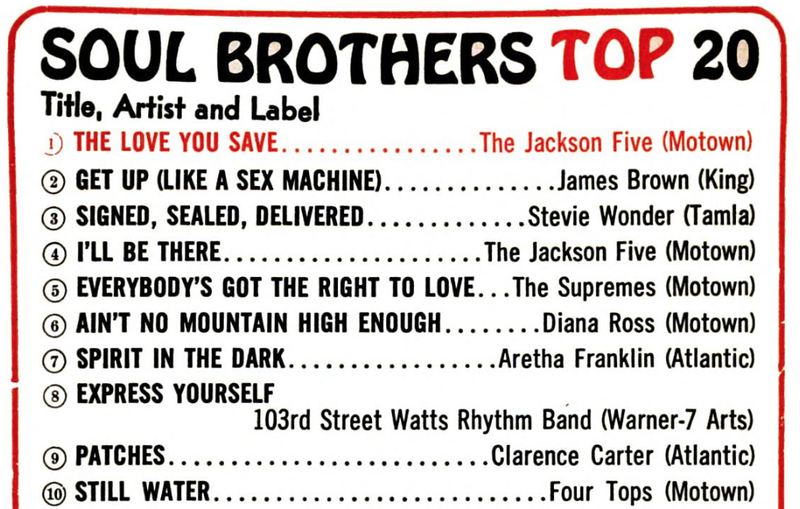 One of the writers credited here is William Garrett, who also co-wrote Motown first #1 pop hit, “Please Mr. Postman” back in 1961; another co-writer is Al Hamilton, who Don’t Forget The Motor City credits with producing this track, under the name Al Kent. Billboard‘s original spotlight review on this album listed this one as a standout cut; it certainly features one of the most energetic instrumental tracks, with a driving beat and fiery, gospel-esque piano chords. The background arrangement is great; again, there are a lot of voices here (Wilson and Birdsong may or may not be among them), and the bigger sound nicely adds to the excitement of the production. What drags the song down a bit is Jean Terrell’s work; although she’s technically in fine voice, she seems to be a bit detached from the song, resting on the beat rather than leading it. Even when she’s ad-libbing, there’s not much fire to her performance; for someone begging “Wait a minute before you leave!” you’d expect something more explosive (listen to “Bad Weather,” released by the group a few years later, and you’ll hear how capable Terrell is of “fire”). Although it doesn’t seem like the standout that Billboard pegged it to be, this is strong filler and a worthy addition to the album. 5. You Move Me: This is another Garrett-Hamilton tune, and if any song on Right On brings to mind the sound of the 1960s Supremes, this is it. To my ears, this one actually sounds a little like “You Ain’t Livin’ Till You’re Lovin'” from 1968’s Love Child; there’s an inherent playfulness in both songs, right down to the coy, almost childlike delivery by the respective lead singers. The lyrics here are what really take it back to classic Motown territory; lines like “You fill my life with so much joy/You’re like a child with a brand new toy” and “You take my frown and turn it up upside down” certainly evoke early Hitsville songwriters, especially set against this bouncy beat. This is one of Jean Terrell’s most exiting vocals on Right On; understandably, considering this is the singer’s first-ever full length album, she tends to approach most of the songs in the same way, not necessarily displaying a wide range of tones and textures in her voice. But on “You Move Me,” the singer delivers a gentle lead performance and some really stunning high notes, as the arrangement forces her way, way up to the top of her vocal register. 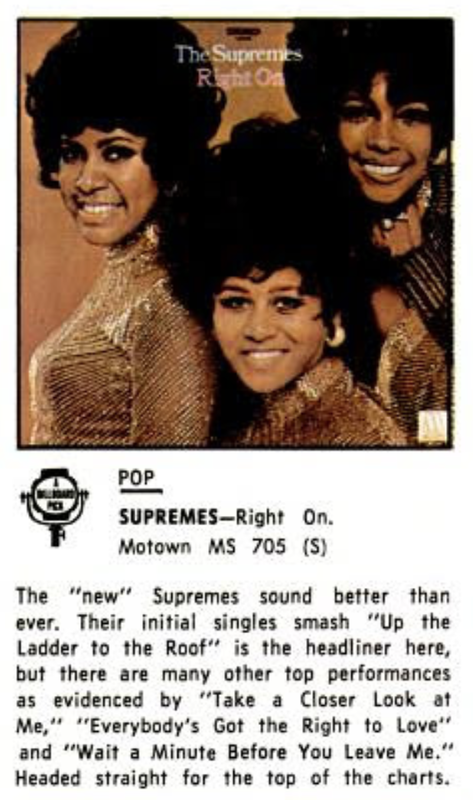 Although producer Frank Wilson would later comment that he tried hard to break the “new” Supremes out from the H-D-H mold, this is a case in which a throwback works; listened to today, “You Move Me” stands out as a classy nod to the group’s historic past. 6. But I Love You More: Speaking of Frank Wilson, this is his third production on Right On, a song that would be featured on the b-side to the single release of “Everybody’s Got The Right To Love.” This track was co-written by Wilson and Sherlie Matthews, one of Motown’s West Coast background singers known as The Blackberries; The Blackberries also recorded the song, and their unreleased version was eventually featured on The Complete Motown Singles, Vol. 12A: 1972. “But I Love You More” is one of only two true love ballads on Right On; backed by a buttery instrumental track, the ladies deliver a sultry and soulful reading, with Wilson and Birdsong getting in some great “oh, yeahs” that really stand out (in a way, the song can be looked at as a forerunner to “Touch,” which Frank Wilson would write and produce for the group the following year). This song did gain some airplay on its own; in the July 4, 1970 issue of Billboard, it was mentioned by WGR Buffalo’s Larry Anderson as a “Best Leftfield Pick” for radio programmers. Though it likely wouldn’t have hit big on pop radio, this song could have been a strong R&B performer had it been promoted on its own. 7. I Got Hurt (Trying To Be The Only Girl In Your Life): This is another tune produced by Clay McMurray, and similar to the earlier “Then We Can Try Again,” it’s an earthy production with a chugging beat and strong lead vocal. Also like that earlier song, Terrell is backed by session singers which may or may not include Mary Wilson and Cindy Birdsong. Interestingly, in the first appendix to her book Dreamgirl: My Life As A Supreme, Mary Wilson notes a December 31, 1970 recording date for this song, which would have been during the final engagement of Diana Ross and The Supremes at the Frontier Hotel in Las Vegas. This could explain the presence of all those session singers; it’s possible producer McMurray went ahead and recorded the song with Terrell and other singers while Wilson and Birdsong were busy fulfilling their live performance obligations, and perhaps they added their vocal later. In any case, although it’s not the most memorable recording on the album, it’s a solid one. 8. Baby Baby: Frank Wilson produced this version of a song he’d already produced on The Miracles back in 1966 (not to be confused with “Ooh Baby Baby”); it was written by The Lewis Sisters, who recorded a few sides for Motown and wrote a bunch of songs for other artists. This version is bold and dramatic, and the most rock-oriented recording featured on Right On; it’s easy to imagine a male-fronted rock band of the era covering this one. It’s a huge change from the doo-wop arrangement of the earlier Miracles rendition, and for my money, this one is a major improvement. Jean Terrell gets to show some nice range here, starting the song in a lower, breathier register before letting loose with more power as the tune progresses. I especially like the combination of all three voices at 1:43 in, as the trio delivers the lyrics “Keep me baby/Yeah, love me baby!” — you can really hear Mary Wilson wailing. Although it’s not particularly useful to compare the 70s Supremes and Diana Ross (talk about opening a can of worms amongst die-hard fans), there are some parallels between this and “Ain’t No Mountain High Enough,” the #1 hit from Diana’s debut album. Both are dramatically arranged updates of existing Motown songs, and both stand out on their respective albums as declarations of love from a mature woman’s point of view. It’s interesting to ponder how this track would have done had it been serviced to radio; considering popular music was becoming more and more experimental by 1970, it’s possible it could have picked up steam and attracted an even wider audience to the music of The Supremes. 9. Take A Closer Look At Me: Right On returns to more familiar territory with this track, produced by Henry Cosby, who’d been responsible for some of the songs on the 1969 Diana-led Supremes LP Let The Sunshine In. This song actually would have fit pretty well on that earlier album; it’s a peppy pop/soul song with a strong instrumental track that sounds more traditionally “Motown” than many of the other selections here. That’s probably why Billboard named this one as a “top performance” in its original review of the album; it’s more expected than something like the previous track, “Baby Baby.” Also like the songs from Let The Sunshine In, the background voices here sound like those of The Andantes; listen at 2:10, when the background singers briefly take over –it’s clearly not The Supremes. There seems to be a notion among some fans and critics that as soon as Diana Ross left The Supremes, producers stopped using other voices to supplement the group’s recordings. This simply isn’t true; The Supremes were on the road constantly in those days, and producers sometimes used other background singers simply to save time. 10. Then I Met You: This is the album’s second real love ballad, an absolutely gorgeous song that is so good it’s hard to believe it wasn’t covered constantly over the next few years. This one was written and produced by Jimmy Roach, who’d co-written the David Ruffin hit “My Whole World Ended (The Moment You Left Me)” a year earlier. Roach worked with most of the big Motown groups after he arrived in Detroit (check out this interesting interview with Mr. Roach here, in which he briefly mentions this song). It’s a wonder that he didn’t handle more cuts on Right On, considering how strong this one is; the swirling instrumental track just seems to float on air, and Jean Terrell matches it with an effortless, unadorned vocal performance. The background vocals are achingly pretty; they stand shoulder-to-shoulder with the very best group work of the era, rivaling masterpieces like “Baby, I’m For Real” by The Originals and “Just My Imagination” by The Temptations. Those songs were huge hits, and this one could have been, too; had it followed “Up The Ladder To The Roof” as a single, perhaps it could have topped the R&B charts. This is a real gem, and a must-listen for fans of 70s soul. 11. Bill, When Are You Coming Back: This song has the distinction of being the second one fans heard from the “new” Supremes, as it was placed on the b-side of the “Up The Ladder To The Roof” single. It was produced by Johnny Bristol of “Someday We’ll Be Together,” who co-wrote it with Pamela Sawyer, and the track was cut back on November 14, 1969, a full two months before Diana Ross gave her final performance with The Supremes. 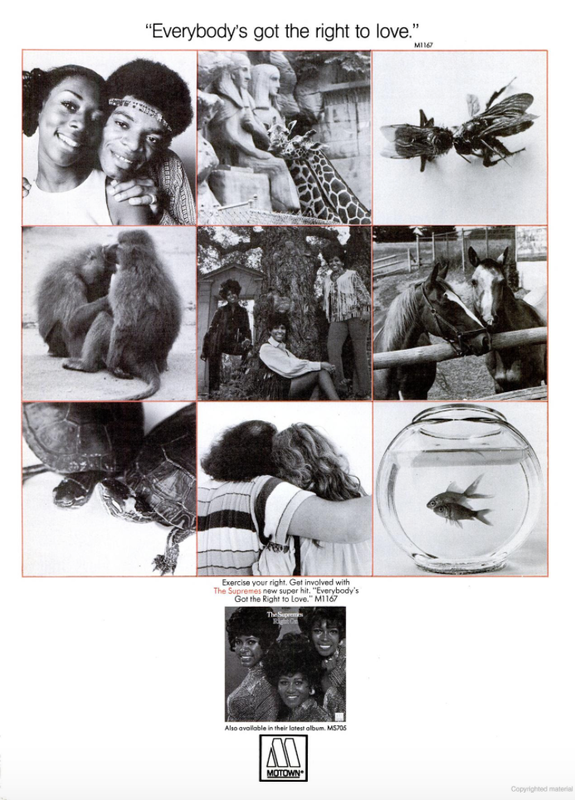 It makes sense that Bristol was working with The Supremes so soon; Motown had long held the philosophy that a producer who’d had a hit with a particular group immediately got the chance to do it again; that’s also why Bristol cut “These Things Will Keep Me Loving You” for Diana Ross, the only song on her debut album not penned and produced by Ashford & Simpson. “Bill, When Are You Coming Back” is actually similar in style to the Ross song; the tracks sound like they could have been cut at the same session. This song, however, boasts a timelier message, as Jean Terrell sings about waiting for her soldier to return home (her voice, by the way, sounds oddly slowed-down at times). It’s an energetic, catchy song, but hasn’t aged quite as well as some of the others here; although it’s a very good recording, it doesn’t quite feel like the step forward for The Supremes as several of the other tracks do. 12. The Loving Country: Right On appropriately closes out with a Frank Wilson production; this one was written by Smokey Robinson and Ivy Jo Hunter, and according to Don’t Forget The Motor City, Hunter had already recorded it for his unreleased album Ivy Jo Is In This Bag. Mary Wilson would describe this song as a “call for universal love” in The 70s Anthology liner notes, and indeed the song fits in perfectly with something like “Everybody’s Got The Right To Love,” which carries a similar message. It’s not quite as memorable as that song, however, partly due to a more complex melody and an unorthodox arrangement that features a soulful “breakdown” section starting at 2:40. The Supremes and The Andantes back Jean up beautifully; the high notes of Louvain Demps are all over this one. Though there is better material on Right On, this is a solid closer and certainly drives home the message that The Supremes were being positioned as beacons of love for the new decade. The original LP release featured this great tear-away poster — how gorgeous is this? Right On was released in April of 1970 and was a solid success, peaking at #25 on the Billboard 200 and #4 on the R&B Albums chart. It’s a remarkably cohesive album, considering it’s the work of multiple producers; not since Love Child in 1968 had the group turned out something so listenable from start to finish. But more than that, it marked an important step forward for the group; not just a step away from Diana Ross, but a step into a new decade. Popular music was changing, and the glitzy Supremes needed to change with it; thankfully, the producers tasked with working on new material for the group clearly sensed that, delivering a set of songs that were modern at the time and have aged rather well. It’s hard to imagine the kind of pressure Jean Terrell faced, an unknown stepping into the shoes of the most worshipped woman in popular music. But Terrell knocks it out of the park; although she approaches many of the songs in the same way here, leading certain tracks to blend in with one another, her gift is undeniable and her confidence would grow with each successive album. This is an engaging, polished effort with a pair of memorable hits and some gems just crying out to be discovered. When it comes to setting the stage for the group’s next act, this album is, indeed, Right On. This entry was posted in Studio Album and tagged Cindy Birdsong, Frank Wilson, Jean Terrell, Mary Wilson, Motown, Right On (1970), The Supremes. Bookmark the permalink. comments aren’t working!!! I need to discuss this! haha…sorry…I’d published too early. NOW…read and comment away!!!! once again you are on top of this one. I think one reviewer noted this album as Elegant Soul , which I think really sums it up. Up the Ladder To The Roof has always been a favorite of mine and I think its one of those songs that still sound s fresh all these years later .i have always been found of You Move Me but I have to admit I forgot about Then I Met You. with all these songs I m not sure why more singles weren’t released from this album. one song I have always thought should have been on this album was Life Beats .great tune. Everybodys got the Right To Love is a good album cut but its honeslty not a song I would have released as a single . thanks for the review,guess what I am going to go a nd listen to. btw, I think the song, Is There A Place For Me in His Heart is an out take from these sessions. Hey David — indeed, this is elegant soul. I agree — “Everybody’s Got The Right To Love” certainly fit a popular message of the time, but it wouldn’t have been my choice for a second single. “Life Beats” would have been a nice addition here in place of something else, and it could have been a good single choice, too. I would switch out I Got Hurt…. Life Beats is sweet.love the harmony. As you stated some songs are with Mary and Cindy while others are the Andantees. But over all I think this album is really good. Motown should of milked this one for all it’s worth. I consider The Loving Country to be the best performance of Jean Terrell’s entire career. I am amazed no one else ever took The Loving Country to the top of the charts. I loved Everybody’s Got The Right to Love, but I think it needs a little more work on it, a little more polish. Almost like it was a demo. Motown captured Jean Terrell at her best, nourished all her considerable talents. I’ve listened to her pre-Motown material and hear how Motown harnessed and refined her raw talent.